The development of manufactured wood products has enabled timber to be used in many landmark large span structures. Timber allows designers to introduce a special ambience and gracefulness to large buildings while fulfilling demanding structural requirements. Timber offers considerable resistance to attack by a wide variety of chemicals including organic materials, hot or cold solutions of acid, neutral salts or dilute acids. Timber is commonly used for vats and tanks for chemical storage and for structural members in factories where corrosive vapours are present. Timber portal frames are cost effective, easily accommodate additional lighting, plumbing, etc and can be erected quickly. The overall appearance is also aesthetically pleasing. Timber portal frames are particularly suitable for use in high visual impact applications eg churches, halls, or potentially corrosive environments eg swimming pool enclosures, buildings housing chemical manufacturer and storage, tanneries, etc. Portal frames may be made from sawn timber, Glulam, LVL and plywood webbed beams. The connections carry significant moments and must have both strength and stiffness to be effective. Timber portal framed buildings may be clad with conventional metal, or fibre cement cladding, as is common for warehouses and factories, or with timber products such as plywood or weatherboards. For other commercial applications, cavity brick, brick veneer, concrete tilt-up or concrete block-work may be required for fire isolation or compliance with local building regulations. Where fire ratings are required, the cross section of glulam portal legs and rafters may be sufficient to provide protection for the members, but extra protection may be required for metal fasteners in the portal knee joint. Arches are an aesthetically pleasing and structurally efficient building system for which timber is ideally suited because of the availability of curved glulam sections. With arched systems, the span to depth ratio of the elements can be very much smaller than the span to depth ratio of a beam to span the same dis tance. They are therefore quite slender structural systems. The arch is one of the oldest structural forms for spanning any distance. It is essentially a two dimensional structural system with all of its strength in the plane of the arch. Dome structures extend the principal of the arch by introducing a third dimension. A dome can be visualised as an arch rotated about its axis of symmetry. 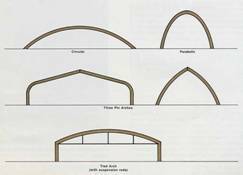 Timber domes can be created by using a large number of intersecting arches, but more slender structures are created by using networks of smaller members. These domes are known as “reticulated domes”. The dome is a very efficient structural system for carrying vertical loads and can result in the most slender of timber structural systems. The branching network carries gravity loads to a large central column. The members tend to be proportioned much as the branches in a tree because the tributary areas of each member are larger the closer they are to the “trunk”. The geometry of these systems means that most of the elements in the “tree” structure carry compression under gravity loads. They are not particularly slender elements. The connections can be complicated as a number of elements join at nodes, and angles at the connection may vary from node to node. Because the largest elements (including the trunk) are bigger than normally milled sawn timber sizes, these structures often make use of composites or Manufactures Wood Products such as glulam, or other laminated materials such as ESL or LVL. The principles of the reticulated dome can be extended to other shapes. Networks of members can be created to define any three dimensional surface. Loads are carried by the structure in compression, tension and bending of the elements. Two layer space trusses can achieve an enormous variety of shapes. Timber trusses are well suited to most building construction. Flexibility in design facilitates a wide variety of roof shapes, with truss shape and size restricted only by manufacturing capabilities, transport and handling limitations. The long span capabilities of trusses can offer designers the flexibility of floor layouts without interior supports. Most timber trusses are pre-fabricated to standard designs using pressed metal nail plates, providing versatility in design, economy, fast delivery, and ease of erection. Both pitched and flat roof configurations are possible. Considerable architectural and structural innovation is possible due to the availability of a wide range of products and connections. Architectural trusses, or exposed trusses with attractive detailing, can be used effectively as a feature to suit the architectural theme of the building. They can convey an impression of strength and tradition or a feeling of lightness and space. They can be left natural, painted, oiled, stained or highly decorated. Designers have a huge scope when it comes to truss shape. • Bolted connections transfer load directly from member to member, but work best where some of the chords are two-element members to allow the joining element to be accommodated between the two pieces. • Plywood gussets can be used to join elements using nails. • Steel nail plates provide a cost-effective means of prefabricating trusses but are less suited where the trusses must be manufactured on site. • Very large truss elements may be joined using fin-plate connections or glued-in dowels. In both these cases, it is wise to build and test prototypes of the connections to ensure that adequate strength can be achieved in practice. Bolted trusses in unseasoned hardwood can provide low cost solutions for smaller spans whee economy is the major consideration. Glulam timber trusses with bolted plate or split ring connectors can be used as an architectural feature. Pole construction makes use of poles (often whole tree trunks) to provide support for gravity loads and resistance against some lateral forces. The poles have dual structural and aesthetic roles. They are frequently much larger than they need to be to fill the structural functions alone. • Pole frame construction – poles act as columns, from the foundations to the roof. The poles in both construction systems can be either embedded into the ground or pinned and supported on concrete footings. Regular or irregular placement of poles and the variable relationship of poles and walls can provide selections of building form to satisfy diverse design requirements. Pole frames may be placed external to the walls, or exposed internally, becoming an architectural feature.